The IWC Portugieser is a legend amongst iconic watches. From the start, it was setting standards in many ways. Platinum models with a tourbillon and celestial chart are the highlights of this series. The history of the Portugieser reaches back to the first half of the 20th century. 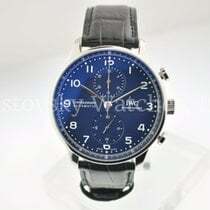 Towards the end of the 1930s, two Portuguese businessmen requested that IWC create a wristwatch that ran as precisely as a marine chronometer. Marine chronometers are incredibly precise watches used by sailors to navigate at sea. At the time, such precision was only possible with pocket watch movements. Thus, IWC placed the Savonnette pocket watch caliber 74 in a wristwatch case. Since this movement's crown was on the right side, positioning it wasn't complicated. However, as it was designed as a pocket watch movement, the caliber 74 made the wristwatch unusually large; it had a diameter of 41.5 mm. At the time, small or rectangular watches in Art Deco style were in fashion. Thus, in terms of design, the Portugieser was ahead of its time. The watch also had a technical advantage: Thanks to its larger pocket watch movement, the first Portugieser was much more precise than its smaller contemporaries. IWC only produced a few hundred of these "pocket watch wristwatches" up until the 1980s. In 1993, the Schaffhausen-based manufacturer reissued the Portugieser. 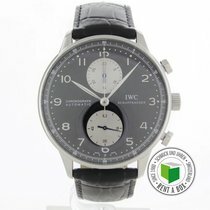 In the following years, it developed into one of the most successful IWC models. The Portugieser, like the pilot's watches in the Pilot collection, is an iconic IWC watch. You can purchase a pre-owned Portugieser Chronograph for around 4,000 euros. New chronograph models start around 5,000 euros. If you're willing to spend about 1,000 euros more, you can buy a pre-owned Portugieser Automatic with an in-house caliber. The watch features a small seconds, date display, power reserve indicator, and runs for seven days before needing to be wound again. New, the Automatic costs around 8,000 euros. One of the most popular IWC watches is the Portugieser Yacht Club. Pre-owned, this chronograph costs around 7,000 euros. New, it costs around 9,000 euros. One of the most sought-after complications is the annual calendar. Unlike a normal date or day/date display, an annual calendar only has to be corrected once a year on March 1st. 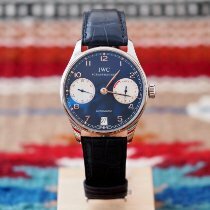 A new IWC Portugieser Annual Calendar costs around 15,000 euros. Portugieser models with a perpetual calendar require correction after 577.5 years. After this period of time, the moon phase display will be off by one day as well and also require correction. The mechanical movement takes both months of different lengths and leap years into account. A pre-owned model costs around 18,000 euros, while a new version of this intricate watch costs around 20,000 euros. Watches with a tourbillon are considered masterpieces of watchmaking. Abraham-Louis Breguet developed the tourbillon towards the end of the 18th century in order to compensate for gravity-related deviations from the correct time. A Portugieser with a tourbillon can be purchased pre-owned and in very good condition starting at 33,000 euros. New, these watches cost about 44,000 euros. The Grande Complication is the highlight of the Portugieser collection. This complicated, automatic wristwatch is a chronograph and features a perpetual calendar with a moon phase display as well as a minute repeater for hours, quarter hours, and minutes. A pre-owned model costs around 120,000 euros, while new, it costs about 160,000 euros. IWC's chronographs are adored by watch fans. The term chronograph literally means "time recorder." A chronograph functions like a stopwatch. Most have a central chronograph seconds hand as well as one or two subdials to keep track of the timed minutes and hours. Additionally, there's a decentralized seconds to keep track of the current seconds. The subsidiary seconds dial is located at six o'clock. The 30-minute counter is located under 12 o'clock. The central chronograph seconds hand keeps track of the timed seconds. You have the choice between a 40.9-mm stainless steel or 18-karat red gold case. If you prefer your chronograph a bit larger, then the 42-mm Portugieser Chronograph Classic is a good option. The smaller chronograph is available with a dial in black, silver, or slate. Arabic numerals are used as hour markers, while dots represent minutes. For use when timing seconds and parts of seconds, IWC included small stick indices on the edge of the dial. Arabic numerals are included at five-second intervals, making it easier to read timed seconds. This precision scale makes it possible to time 1/4th of a second. The caliber 79350 powers the chronograph. It's based on the ETA Valjoux 7750 movement, one of the most successful automatic chronograph calibers of all time. The movement has a 44-hour power reserve. Since it also features a stop-seconds mechanism, you can set your Portugieser Chronograph to the exact correct second. The automatic winding ensures that the movement is always wound, as it winds automatically with the motion of the wearer's arm. The balance frequency is 28,800 alternations per hour (A/h). The Portugieser Sidérale Scafusia is the most complicated watch IWC has ever produced. They spent 10 years developing it. Highlights of this watch include its so-called constant-force tourbillon, a 96-hour power reserve, and a sidereal time display. Sidereal time differs from traditional solar time by approximately four minutes each day. Sidereal time is required in certain circumstances, such as in order to find the same star each night in the same position. Sidereal time is primarily used as a timescale by astronomers. This is based on the visible movement of the stars caused by the Earth's own rotation. One sidereal day is equal to the time that it takes the Earth to complete a full rotation on its axis. The Portugieser Sidérale Scafusia displays sidereal time on a subdial at 12 o'clock. The central hour and minute hands as well as the decentralized seconds hand display the solar time. The small seconds hand is attached to the tourbillon cage. Since the tourbillon makes one full rotation every minute, the seconds hand also makes one rotation in a minute. The power reserve indicator, which displays when you need to wind the manual caliber 94900, is located between four and five. The constant-force tourbillon in the Portugieser Sidérale Scafusia is unique. IWC successfully managed to create a mechanism to stabilize the balance amplitude, keeping it constant. In mechanical movements, the power transferred from the mainspring to the escapement typically varies. When fully wound, the tension is high. However, with time, the tension lessens and the amplitude declines. This loss of amplitude leads to deviations from the correct time. The constant-force tourbillon keeps the balance wheel's degree of rotation constant, which helps the watch run precisely. Two parallel, linked barrels deliver 48 hours of constant force. Afterward, the watch runs for another 48 hours without the constant-force mechanism. You can recognize when the mechanism isn't running when the seconds hand runs more smoothly and the power reserve indicator displays that 48 hours or less are remaining. After the first 48 hours pass, the seconds hand runs at a balance frequency of 18,000 A/h, making five small jumps per second. In the first 48 hours with the constant-force mechanism running, the hand makes one movement per second like a quartz watch. 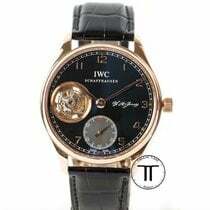 IWC also uses the constant-force tourbillon in their sport watch Ingenieur Constant-Force Tourbillon. A celestial chart is located on the back of the Portugieser Sidérale Scafusia. The chart displays the starlit sky over a specific location. There are between 500 and 1,000 visible stars on the chart. Marked constellations allow for easier orientation. Thanks to a polarization filter, the chart is blue during the day and gray at night. Two 24-hour rings on the back display the time: The outer ring indicates the mean solar time and the inner ring, sidereal time. Furthermore, the watch displays sunrise and sunset in addition to a perpetual calendar which counts days numerically. Thus, day 1 is January 1st, day 31 is January 31st, and December 31st is day 365. During a leap year, December 31st would be day 366. This counting system is common amongst astronomers. The abbreviation LY stands for leap year; a small window indicates whether or not it's a leap year. In order to calculate the current date, you have to add the middle number in the large window to the smaller number on the right. The 46-mm case of the Portugieser Sidérale Scafusia is made of either platinum or 18-karat white or red gold. Due to its larger size, it's well suited for larger wrists. It is also rather thick at 17.5 mm. This makes sense, however, as its 520 individual movement pieces require space. With a platinum case, the watch weighs 280 g. The strap is made of alligator leather from the Italian luxury manufacturer Santoni.